PITTSBORO -- Central Carolina Community College recently hosted the Central Carolina Culinary Institute (CCCI) Sustainable Culinary and Farm Tour Conference at the Chatham County Campus in Pittsboro. Career and Technical Education Foods, Culinary, and Agriculture teachers from across the state had the opportunity to tour the college's student farm, which ranks No. 14 among the best college farms in America, according to Best College Reviews. In addition, the teachers got an up-close look at the college's Culinary Institute, where they were treated to a lunch reception. Central Carolina's Culinary Institute's (CCCI) mission is to present a curriculum for students to develop expertise and passion for a holistic, nutritional, and naturally sustainable lifestyle. The program prepares graduates for successful careers in the culinary field and is committed to promoting the use of whole, organic, and local foods for general wellness and therapeutic applications. Through partnership with the college's Sustainable Agriculture program and local farmers, CCCI supports chemical-free, natural foods to create healthy lifestyles throughout the local community and region for all ages. For more information on the Central Carolina Culinary Institute, visit the website www.cccc.edu/culinaryarts. For more information on Central Carolina Community College, visit the website www.cccc.edu. Career and Technical Education teachers from across the state had the opportunity to tour Central Carolina Community College's student farm, which ranks No. 14 among the best college farms in America, according to Best College Reviews. 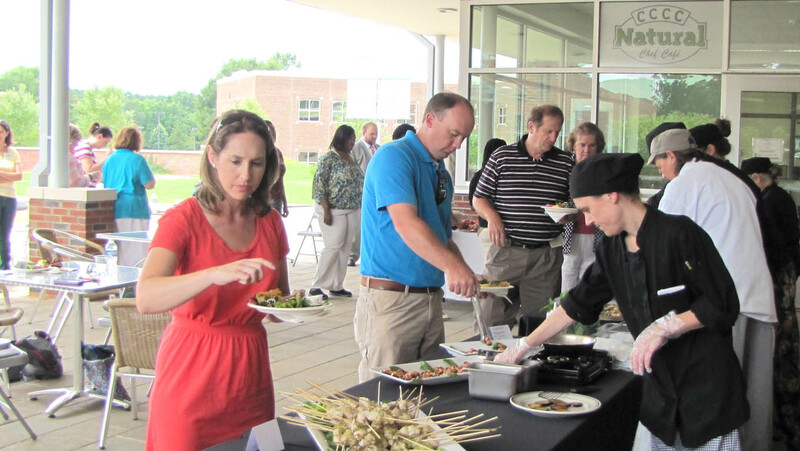 Career and Technical Education teachers from across the state got an up-close look at Central Carolina Community College's Culinary Institute, where they were treated to a lunch reception.